The most famous cinematic example of an evil, sentient computer running amok, mad with power, has to be HAL 9000, right? The villainous Heuristically programmed ALgorithmic computer from Stanley Kubrick’s visionary 2001: A Space Odyssey is practically the poster child for the fear of technology on a rampage, doing what it has to in order to protect itself from human incursion. It can reason, interpret facial expressions (and read lips), interpret and reproduce emotion, and all manner of things that heretofore only humans could do. The technology is a great advance, and that scares the hell out of all of us. 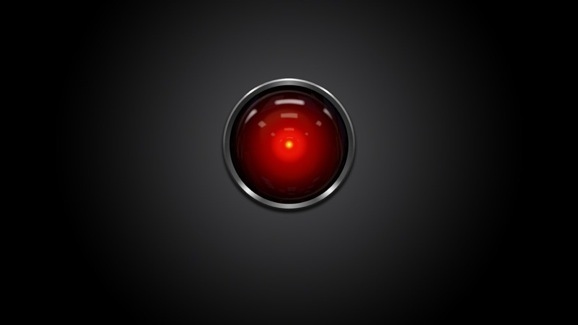 The Physically Independent Neural Network (PINN) in Transcendence is, if not a straight up reincarnation of HAL, it at least owes its very existence to the nefarious red-eyed computer. Perhaps PINN is HAL’s great-grand computer. Sure, a pixilated Johnny Depp is nowhere near as ominous as that unblinking red light—even if he is phoning it in—and the goal of the movie is definitely to make you wonder this really is his Will character, or some wicked other thing pretending to be, but there is a definite familial line.